I’m not someone who thinks ahead when it comes to wedding or shower gifts. When I get an invitation to a baby or bridal shower, I immediately go on the registry and pursue all of the gifts and pick out what I want to buy and then I think “oh I have plenty of time for that”. And then suddenly it’s a week before the event and whatever I wanted to give as a gift has already been purchased. I have done this more times than I should admit. But luckily I remembered the best bridal shower gift that was given to me and now it is my favorite bridal shower gift to give. 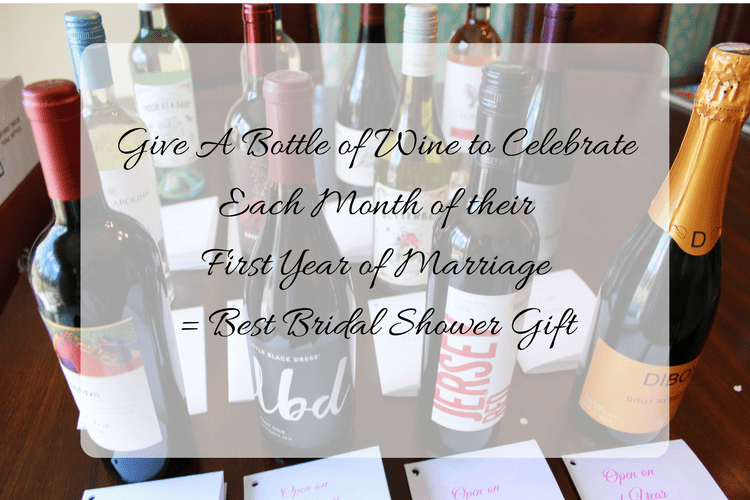 Wine is always one of my favorite gifts to give or receive so when I was gifted 12 bottles of wine, one for each month of our first year of marriage, I was so excited. It was a gift that kept giving every month along with a little card to go with each bottle. I loved the surprise of opening the card, unwrapping the bottle and seeing what delicious wine we could toast our monthly wedding anniversary. The final bottle on our 1 year anniversary was a bottle of champagne. I recently put this gift together for one of my dearest friends for her bridal shower and I was so happy with how it came out. Here is a quick how-to with printable cards, making this an easy gift to give. 1 750 ml bottle prosecco. Know your budget, my budget was $10 a bottle or less. I splurged on one bottle of wine because it had “Jersey” in the name and the bride is from New Jersey. Most liquor stores keep a large supply of $10 and under bottles in the front of the store, this is a good place to start shopping. Many liquor stores list the wines rating points on the shelf, anything in the 80’s is good, in the 90’s even better. Look for fun names and labels. I found wines with flowery labels perfect for spring and ones that were called “Hot to Trot”, “Simply Naked” and “Butterball”. 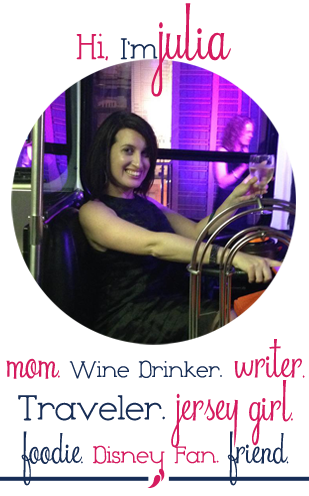 When in doubt ask for help, most liquor stores now have a wine expert on hand. Or you can use the printable cards below that each have a quote in them, (see I’ve already done the hard work for you). If using printable cards, fold each card. Wrap bottle in tissue paper and tie ribbon around the neck of the bottle to hold the tissue paper together. Once all bottles are in the box, tape the top and bottom with packing tape to make sure it is secure and that the bottom won’t fall out. Unless you want the recipient pulling out each bottle I suggest taping a card to the top of the box explaining that there are 12 bottles of wine in the box, each to be opened on the couples monthly anniversary. This is a gift that I loved receiving and that I loved giving. I’m so excited for my friend to open each bottle and card over the next year as her and her husband celebrate. This gift is thoughtful but also easy to put together and it will stand out in a sea of dish towels, china and sheets and will be one that they will remember for years.